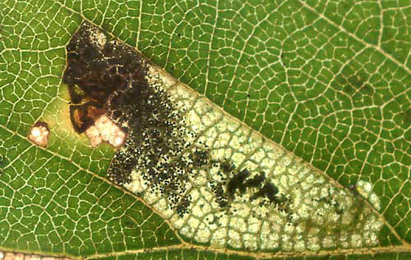 Leaf-miner: The mine begins as a contorted gallery, when the young larva can be seen to have dark plates on each segment. These plates are later lost and the gallery becomes a blotch with scattered frass (UKMoths). Mine begins at a globular, black, lower-surface egg shell. From there starts a short tortuous corridor, that widens into a blotch, often between to lateral veins. Frass dispersed. Pupation outside the mine (Bladmineerders van Europa). Yellow with light brown head, lies belly-up in the mine. Young larvae with a series of 12 black ventral plates (van Nieukerken, 1985a). See Gustafsson and van Nieukerken (1990a) for a description (Bladmineerders van Europa). Time of year - larvae: July - September (British leafminers; UKMoths). Time of year - adults: There is one generation, with adults in May and June (UKMoths). Distribution in Great Britain and Ireland: A relatively local species occurring in the south and west of England and parts of Scotland (UKMoths) including Anglesey, Bedfordshire, Buckinghamshire, Cardinganshire, Derbyshire, Dorset, Dumfriesshire, Dunbartonshire, Durham, East Norfolk, East Ross, East Suffolk, East Sutherland, Easterness, Edinburgh, Glamorgan, Haddington, Hertfordshire, Huntingdonshire, Isle of Wight, Kirkudbrightshire, Linlithgow, Main Argyll, North Aberdeenshire, North Ebudes, North Hampshire, North Northumberland, Shropshire, South Aberdeenshire, South Hampshire, South Lancashire, South Northumberland, South Wiltshire, Stafford, Stirlingshire, West Norfolk, West Ross, West Suffolk, Westmorland and Wigtownshire (NBN Atlas). It also occurs in the Republic of Ireland (as south-west Ireland) (UKMoths). See also Ireland's NBDC interactive map. Distribution elsewhere: Widespread in continental Europe including Austria, Czech Republic, Danish mainland, Estonia, Finland, French mainland, Germany, Italian mainland, Latvia, Lithuania, Norwegian mainland, Poland, Russia - North, Slovakia, Sweden, Switzerland and The Netherlands. Also recorded in the East Palaearctic (Karsholt and van Nieukerken in Fauna Europaea).